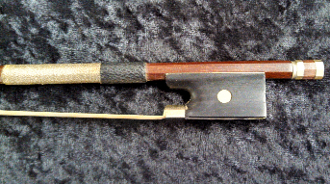 This exceptionally nice, full size brazilwood violin bow for sale was made c 1920 in a French shop. It bears no maker stamp; only a "Made in France" stamp. This bow is highly unusual because very few brazilwood bows were ever made in France; France specialized in high end pernambuco bows. This bow is very nicely made; the tip is exquisite. The round stick is perfectly straight and the camber is excellent. It handles better than almost any brazilwood bow. It has typical French silver winding and is fully mounted/fully lined with nickel on an ebony frog. This French Brazilwood Violin Bow has been previously used, but has no damages and is in excellent condition. For $500.00, if you are interested in an affordable French bow, this is the bow for you!